In this article , we will list down the common problems faced by laptop users and identify what can be done to resolve it ? Laptop screen breakage/ Spots on Laptops : There can be two problems related to the laptop screen : (a) Spot on laptop screen (b)screen breakgae . Spot on the laptop often appears when the user touches the screen with his hand . Since laptop have LCD Screen( Liquid Cystal Display) contains liquid including millions of colours forming the crystal clear picture. When it is pressed the liquid moves from its actual place leaving behind the vacuum at that particular spot . We can avoid this problem by carefully handling the laptop . For cleaning use clean cloth with soft hands. The Second problem of Laptop Screen breakage is more dangerous . You have to change the screen in that case . Our Laptop Repairing Course deals with circuitery of Montiors & laptop screens . 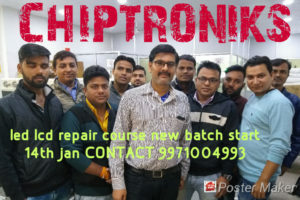 So any problems related to laptop screen circuit can be solved after you undergo our laptop repairing course . LCD joint breakage : This problem is usually because of Users habit . We should apply too much pressure while cloing the two halvs of laptop , because that can breakage of LCD Joint . Keys of keyboard : This is more prevalent . We can very easily change the desktop keyboard but that of Laptop . This problem arises due to :(a) We do not clean the keyboard of laptops so fustr particles remain there and thus keys can become inefectice (b) We apply excess pressure on the keys while typing . Laptop should not be used fot typing purpose. CD or DVD roms :The Life scpan of CD/Dvd Drive is less in laptops . There is one important point to note . We should not keep a CD in Cd drive when we do not need it . Because each time the laptop starts , head of DVD/CD Rom will be used . So only use it when you require. Window/Software recovery issues : Now a days laptops are coming with inbuilt window operating system . But important thing is to make recovery CDs of your laptops , so that you can always recover it . Laptop Booting Problem :Well it is hard to diagonise , but mostly it is related to RAM Failure , or window corruption . So do a fresh install . If that does not solve , take your laptops to nearest repair centres . Well we have listed some of the common problems of laptops. These can be solved once you know the tricks to handle them . Our card level course of laptop repairing exactly solves the need for such course . For any queries , you can always contact us .